Welcome to Custom Garage Works! 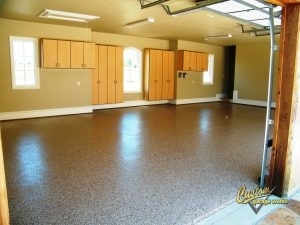 Back in 2003, we began by offering high quality garage floor coating in Decatur,TX. While we were unable to locate the services we wanted inside of the industry, we did not let that stop us, but instead, we decided to join the industry ourselves. Presently speaking, we are able to provide our clients with some of the best garage storage solutions on the market, along with floor coatings that are stronger and more durable than traditional epoxy. We are passionate about fantastic garages, and while we began with a professional garage floor coating service, we are happy to provide many more custom garage solutions to the DFW area. 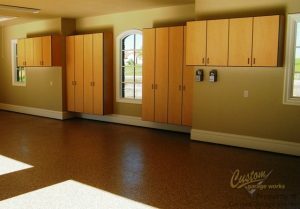 One of our most popular garage services is our garage floor coating in Decatur, TX. This coating is so popular because it is both more resilient, and cures faster than traditional epoxy. While with epoxy floor coatings, you need to avoid UV exposure and watch out for flaking, our polyurea-based floor coatings are much more durable. Since we choose to use a diamond grinder to prep the concrete for coating, as opposed to acid etching, we can ensure a higher quality end result. Give us a ring at 214-494-9068 or 817-308-1305 for your free estimate today, and we can tell you more about our premium garage floor coating service. Garage Floor Grinding By utilizing diamond grinding instead of acid etching, we can ensure a stronger, more resilient coating that will work for years. When you choose a storage solution from Custom Garage Works, you won’t ever need to shuffle through piles of clutter in your garage again. We know that a brand new garage floor looks best when it won’t be covered by other items in your garage. With options such as garage cabinets and overhead storage racks, we have a variety of solutions for our clients’ garage organization requirements. Designed specifically for garage use, our garage cabinets are among the best in the business, and our storage racks are designed for high capacity storage. We are committed to helping our clients get the perfect garage floor coating and organization for their requirements and budget, and we look forward to serving you! Overhead Storage Racks Do not waste your overhead space! Our overhead storage racks let you get more from your garage. Storage Cabinets Our custom garage cabinets are precisely designed to be stronger, and to resist hot and cold temperatures.